This drill was contributed toFast Model Sports Basketball Drills and Plays Library by Drew Hanlen, an NBA Strategic Skills Coach & Consultant. He has helped over 25 NBA and NBA pre-draft players including David Lee (Mavericks) and Bradley Beal (Wizards). The drill is from his Team Toughness Drill Book. Drew is an NBA Strategic Skills Coach & Consultant that has helped over 25 NBA and NBA pre-draft players including David Lee (Warriors) and Bradley Beal (Wizards). He is also the Head Skills Coach for the Reebok Breakout Challenge and has worked various events for Nike Basketball. This is a great drill to get your players to box out on defense and crash and avoid box outs on offense. 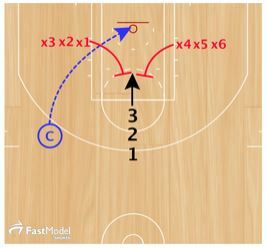 Too many rebounding drills benefit the taller players and don’t truly reward players for boxing out or getting around box outs, so this drill is perfect to reward pursuit effort. Coach will shoot the ball. On the flight of the shot, both defenders will sprint to box out the offensive player, while the offensive player will try to get around the block outs and pursue the offensive rebound. Defenders do not pursue the rebound. Instead, they continue to box out and try to keep the offensive player from touching the rebound before the ball bounces twice. If the rebound bounces twice before the offensive player touches the ball, the defensive team gets one point. If the offensive player touches the ball in the air, the offensive team gets two points. If the offensive player touches the ball after one bounce, the offensive team gets one point. If the offensive player rebounds the ball in the air and finishes a put-back, the offensive team gets three points. Both teams play offense for two minutes then defense for two minutes. Team with most points at the end of four minutes wins.